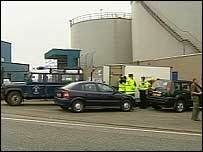 Fisheries officers investigating landings have carried out a raid on a fish processing factory in Peterhead. The operation was at Alexander Buchan Ltd in the Aberdeenshire town's harbour, which is believed to handle fish such as mackerel and herring. The Scottish Fisheries Protection Agency (SFPA) said it executed search warrants alongside Grampian Police. An agency spokesman said: "The SFPA and Crown Office are conducting criminal investigations into alleged offences." The police diving unit was involved in the operation and investigators could also be seen examining pipe work and boxes. The SFPA spokesman said in a statement: "SFPA has been working with other agencies to investigate fish landings made to the Alexander Buchan Limited fish processing factory in Peterhead. "As a result of this work, the Scottish Executive can confirm that search warrants were executed this morning by Grampian Police and SFPA officers. "It would not be appropriate for the executive or the Crown Office to make any further comments at this stage." Scotland's mackerel fishing season was brought to an early close earlier this year following previous raids investigating alleged illegal landings at two processing factories in Peterhead and Shetland.